Invented in 1929 by tennis great Rene Lacoste, the polo shirt continues to be part of every man’s wardrobe. Back then, the polo served as an alternative to standard court attire of the shirt and tie. Today, it still remains an alternative as it can be easily dressed up for an evening affair, and dressed down for a good old tennis match. Invented in 1929 by tennis great Rene Lacoste, the polo shirt continues to be part of every man's wardrobe. Back then, the polo served as an alternative to standard court attire of the shirt and tie. Today, it still remains an alternative as it can be easily dressed up for an evening affair, and dressed down for a good old tennis match. There are two basic rules to wearing the polo shirt. Rule#1: It CAN NOT be too tight. So what exactly is too tight? If you can't stick your finger in between the sleeve and your bicep, it's too tight. Most polos are made of 100% cotton. If it looks like you're wearing a neoprene wet suit, then it's too tight. Ideally, you want the shirt to be comfortably fitted. The sleeve ring should sit nicely around your bicep. If you see a lot of flack around the sleeve, the shirt might be a bit big. Rule#2: It CAN NOT be too long. Why? Because polos when worn too long look like a girl's shirt dress. However, it should be long enough so you can tuck it in without the shirt bunching up in your waist. When the shirt's length goes past your hips, its too long. 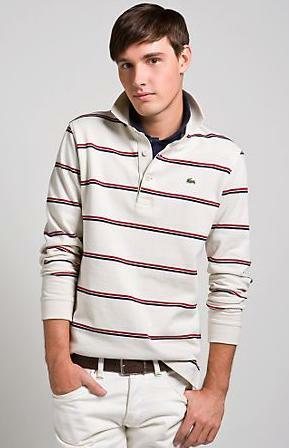 Lacoste has a great fit guide that's fairly easy to follow. They categorize the cut of their shirts to four fit types: the classic, the retro, the modern and the pima. Bottomline, once you find a brand you like and a cut that best fits your body type, stock up on a variety of colors and prints. The polo is one of the most versatile pieces in a man's wardrobe. We've all seen the polo, blazer and jean combination. And then there's the polo and khaki look. And lastly the polo and golf short which we see our dads wear a lot during the summer. What we don't see a lot of are the creative ways of wearing your polo. 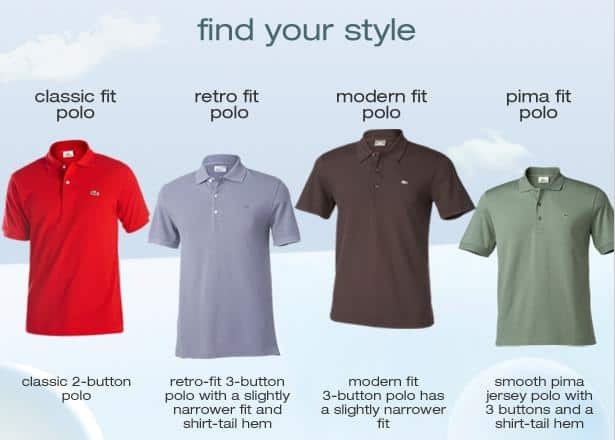 As the days get warmer and longer, try a couple of these variations of polo wear. Be careful on when you turn up your collar. If you're hanging out with the guys at Country Club, it's most likely appropriate. At a business meeting, keep your collar down. A long sleeve polo is a great alternative to a dress shirt. 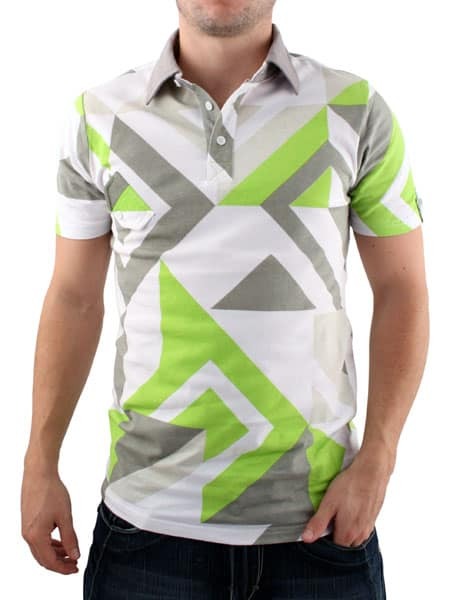 Also known as the Rugby Polo, this piece is nice to have during those cool spring or summer nights. This polo also meets most casual friday dress codes in corporate America. Learning to wear the polo right can be tricky sometimes. Each brand has different styles and fits. American brands like the Gap lean more towards the classic boxier cuts. British brands like Fred Perry and French brands such as Lacoste are a lot slimmer in fits than their American counterparts. At the end of the day, what matters most is how it fits. So shop around, try on a few brands and fits, and when you've found the perfect style purchase a few colors and patterns that best suit you. Pop your collar ever? No. Agree. There is never a good time for a popped collar. My chain is so big that I can’t pop my collar.